The New York State Public Service Commission on Feb. 7 authorized Consolidated Edison Company of New York Inc. to implement a portfolio of demand-side solutions at a cost capped at $223 million, in a bid to ease natural gas demand in the utility’s supply-constrained areas. The commission said that the need to address surging gas demand has taken special urgency following the utility’s announcement in January that it will stop enrolling new gas customers in the Westchester County region from March 15, in order to maintain reliability for existing customers and offer service to critical facilities. The program, which will focus on energy efficiency and heating electrification from 2019 through 2024, is a part of the utility’s Smart Solutions strategy that aims to reduce gas usage and procure alternative resources to address a projected growing shortfall of peak gas day pipeline capacity. The commission denied Con Edison’s request to incentivize shareholders to add supply-side enhancements such as compressed or liquefied natural gas supply sources, noting that the company can pursue such projects without such incentives as it has done in the past. The utility’s demand-side portfolio will target low-to moderate income customers, multifamily properties, and government buildings that provide critical community services. 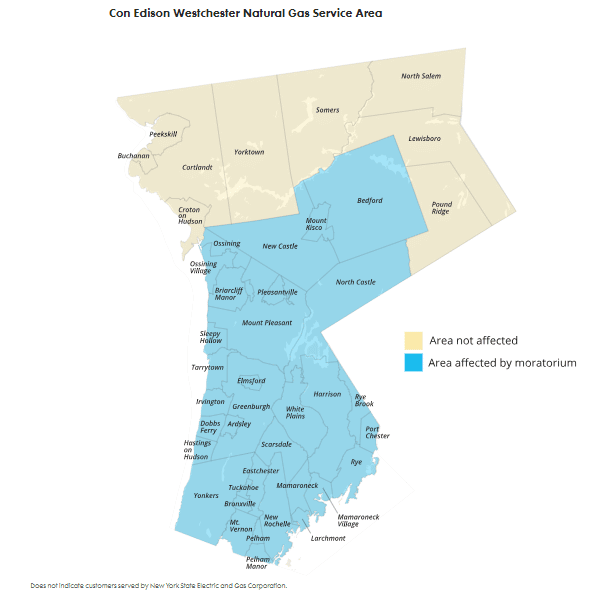 A public hearing will he held on Feb. 13 to gather input on Con Edison’s decision to temporarily suspend new gas service to customers in Westchester County.